This is a great weeknight dinner – home at 6:30, dinner at 7:15 in front of the fire. The quality of the paprika is key here, I use Penzeys which can be found at www.penzeys.com. I added the peas to make this a one bowl dinner. 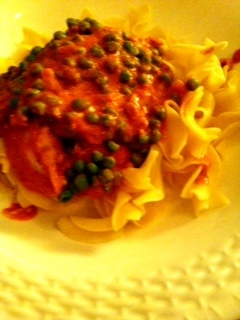 This entry was posted in Recipes and tagged chicken, Chicken Breasts, Egg Noodles, Hungarian Paprika, Penzeys, Sour Cream. Bookmark the permalink.